That the fundamentals of a dual-phase lightsaber are not rare. This type of lightsaber can be achieved by any lightsaber with two or more actively used crystals in the energy loop, or it can be a property granted by a special functioning of the power cell. Its most basic manifestation within the weapon is the ability to alter the length of the beam or cutting section. Anakin Skywalker's lightsaber is dual-phase capable, for example. The uncommon dual-phase lightsaber is any lightsaber created to work at two different blade lengths. Historically, these complex blades were created mostly by ancient Jedi and Sith in their many heated wars; the surprise advantage of a blade which could shoot forth several feet or inches was worth the additional difficulty of constructing a lightsaber with several focusing gems and outweighed the fact that a lengthy blade was often inferior from a pure fencing perspective. Darth Vader's lightsaber is an example of this, as he has buttons on his hilt allowing him to change the blade length at will. In Dark Apprentice, with the help of the spirit of Exar Kun, Gantoris created such a lightsaber. Similarly, in Splinter of the Mind's Eye, Luke Skywalker adjusts the controls of his saber to produce a short, pencil-thin blade, which he uses to cut through the bolt of a door lock. The New Jedi Order Jedi Knight Corran Horn also used one of these; however he tended to keep the shorter blade ignited and the weapon seemed to only have two settings—standard and extended with no fine control over the lengths of either. The double-bladed lightsaber, saberstaff, battlestaff, staff saber or lightstaff, is a unique different in which the handle is about three times the length of a standard lightsaber and has two beam emitters; one at each end. The beams can be activated and deactivated independently, allowing for much versatility. This type was invented by the Dark Lord of the Sith Exar Kun nearly four thousand years before the Battle of Yavin. Kun was able to carefully adjust both its length, from half a meter to one and a half meters (1.5 to 5 ft), as well as its intensity, allowing the blades' power to vary from that of a deadly blade to an intangible, harmless beam of light. Although in later years the double-bladed lightsaber is associated with the Sith, this is not always the case and Jedi who wield this different are not more susceptible to the dark side. As a tool used primarily for training in the Jedi Academy against multiple opponents, some Jedi find that they prefer this weapon for its diversity as well as its devastating power. In combat with multiple opponents, the provision of two blades allows for greater self-defense through increased blocking ability. Offensively, dual-blades increase striking probability to juxtaposed adversaries. When mastered, the double-bladed different is perhaps the most elegant of all lightsabers. Admittedly, it is not easily controlled and few Jedi maintain the weapon over their career. Despite the strength of the double-bladed lightsaber, the long size of the handle itself seems to be a weakness in battle against another lightsaber-wielding foe—it was cut in half when Darth Maul used it in the duel with Obi-Wan Kenobi and Qui-Gon Jinn in Star Wars Episode I: The Phantom Menace. 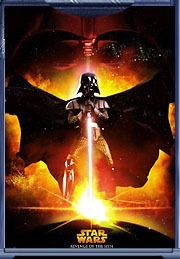 One was also cut in half in the Dark Horse comic book Star Wars: Resurrection, when the resurrected Lord Maul dueled Darth Vader for the apprenticeship of Darth Sidious. The handle of the double-bladed lightsaber could be made of Prink or Cortosis ore to prevent damage from another lightsaber. Over time, use of double-bladed lightsabers as primary weapons has diminished due to their aggressive Sith-like nature and usage. Besides Exar Kun, notable wielders of this weapon include Zez-Kai Ell, Jorak Uln, Uthar Wynn, Darth Bandon, Bastila Shan, Darth Maul, Azrakel the Dark Warrior, and possibly Jaden Korr. There are also different lightsabers with shorter hilts and blades (known as short lightsabers or lightdaggers) that can be wielded as offhand (weaker hand) secondary weapons. These are for Jedi who fight with two lightsabers for the dual-bladed lightsaber combat style Jar'Kai, which is used by Ancient Jedi Master Kavar and fallen Jedi Sora Bulq or as the primary lightsaber of a small Jedi like Yoda, Yaddle or (presumably) Even Piell. This technique was possibly inspired by the Japanese art of Hyoho Niten Ichi-ryu or European sword and dagger fencing. It was said by Master Maruk in the book Yoda: Dark Rendezvous that those who practice dual sword wield have a tendency to rely too deeply in their swords. 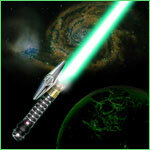 The electrum lightsaber is simply a lightsaber with a hilt forged from electrum. 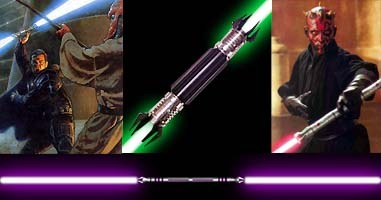 Mace Windu's lightsaber in Episode II and III is an example; Sidious's lightsaber is also similar. In the Jedi Order, only council members are allowed to have an electrum-covered lightsaber.